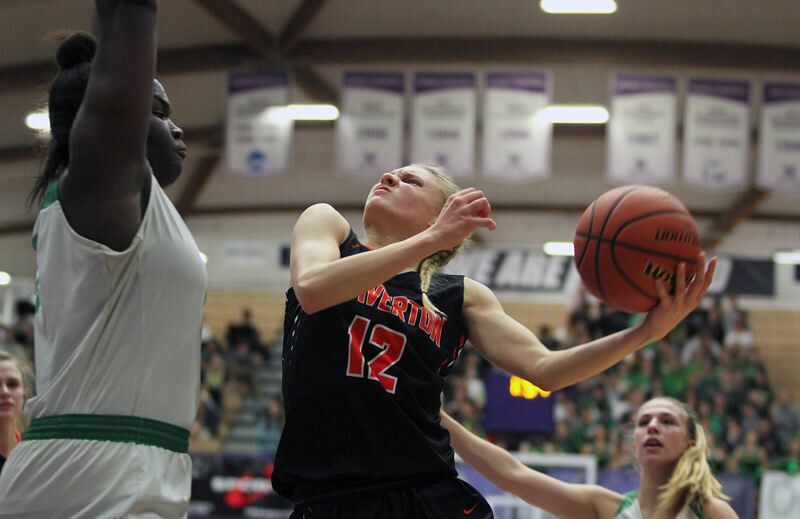 It took a year to get there, but the Beaverton girls basketball team finally got the revenge it so dearly wanted against West Linn. The Beavers, who lost to West Linn in the third-place game at the Class 6A state tournament in 2018, got back on the Lions Thursday, coming from behind to beat West Linn 50-42 in the state quarterfinals at the Chiles Center. "We know that (losing) feeling, we hated that feeling last year and had that in the back our heads, like 'No, we're not going to let this happen again. That was burning in me," said Beaverton junior Laura Erikstrup, who shook off a bout of bronchitis to win Player of the Game honors after scoring 13 points and adding 12 rebounds, two assists and two blocks. "Who cares if you don't feel well? Everybody else in the state is probably sick and tired (too and) this is such a great opportunity." The Beavers secured their win with a great late-game stretch that saw them outscore West Linn by 10 points over the contest's final 8 minutes, 57 seconds. "In practice we work on end-of-game situations every day," said Beaverton junior Sydney Erikstrup, who added 10 points, nine rebounds and two steals. "We work on being down two, up two and doing the little things, like making sure we're open before we come to the ball. And our team bond was big. … In the end, we dug in together as a team and got it done." With the win — the team's third straight — fifth-seeded Beaverton improved to 18-10 overall and advanced to a semifinal matchup against top-seeded Metro League foe Southridge at 6:30 p.m. Friday. The Skyhawks (24-3) beat eighth-seeded South Medford 48-29 in their Thursday quarterfinal. "We're hungry for it. We want it so bad," Sydney Erikstrup said of the Southridge matchup. "We have to share the ball well (and) look for the best shot, not just the good shot. We have to kick (the ball) in and out because if we do, there are going to be so many wide openings. We're going to find great shots." The fourth-seeded Lions, meanwhile, saw their four-game winning streak snapped and fell to 20-7 overall. "We knew coming in here that playing at the Chiles Center and playing on our home floor are different," said West Linn sophomore Audrey Roden, who led her team with 19 points, eight rebounds and two steals. "The refs don't call anything; we have to fight for everything. They knew that more than we did and I feel like they took advantage of that better than we did." "At halftime, we had more (rebounds) than them, and we always say 'Boards win games,' but by the end of the game, they had (11) more boards than us and that's what killed us," said West Linn junior Elisabeth Dombrow, who added eight points and three rebounds in the loss. The Lions will be back on the court at 9 a.m. Friday in the consolation semifinals when they face eighth-seeded South Medford (23-5 overall), the Southwest Conference runner-up. "We're a team that never gives up," Dombrow added. "We're always a team that battles through, so it's going to be hard with the early-morning game and all the emotions, but we can definitely do it and get back against South Medford." The Lions certainly held their own in Thursday's first quarter rallying from an early 5-0 deficit to lead 15-10 at the end of the frame. After their slow start, West Linn outscored the Beavers 15-5 over the quarter's final six minutes, with Roden burying a pair of 3-pointers, sophomore Payton Shelstad hitting another bomb from long range and sophomore Aaronette Vonleh adding four points of her own. Both Erikstrups scored five points in the period to keep the Beavers close. The Lions still led 19-14 after Roden rebounded her own miss and scored with 5:48 remaining in the first half, but Beaverton came back in the remaining minutes of the period. The Beavers stitched together a 7-2 run over the next 3:43, getting a Laura Erikstrup putback, a fastbreak basket from sophomore Alexa Borter, two Laura Erikstrup foul shots, and finally, a Sydney Erikstrup free throw that tied the game at 21-21 with 2:05 left in the half. The Lions led 22-21 at the half, then pushed their lead back to 26-21 on an inside hoop from Shelstad and a pair of foul shots by sophomore Cami Fulcher 1:30 into the third quarter. And West Linn still led 32-29 when Dombrow banked home a shot at the end of the fast break with 1:35 to go in the stanza. But this time, when the Beavers came back again, the Lions had no answer. Beginning with Beaverton junior Mary Kay Naro's driving hoop in the final minute of the third quarter, the Beavers outscored the Lions 20-10 in the game's final 8:57 to leave West Linn behind. Naro led the way down the stretch, scoring eight of her 13 points in that run, while junior Jordyn Reverman scored five more and sophomore Mackenzie Naro added a 3-pointer for the Beavers. "We knew it was going to be a battle coming in," Sydney Erikstrup said. "We did the little things in the end and that's what it came down to. We struggled to hit shots. We didn't play defense well at times, but we locked down at the very end and did what we needed to do." On their end of the court, the Lions went just 2 of 10 from the field (with Roden hitting two more "3s") and 4 of 4 at the line with four turnovers in the final nine minutes. "I think it was rebounding," Roden said. "We lost the rebounds by 10 or 11 and those are just so many second-chance shots they got that we didn't which was a really big point swing." Naro added 13 points, three assists, two rebounds and two steals for Beaverton, while Fulcher added six points and four assists for West Linn.